This hack converts the Alcatel SpeedTouch Home (both Analog and ISDN models) to an Alactel SpeedTouch Pro. The advantage here is that you get some really cool features. Common problems are explained here, please send me any new problems and or solutions so I can keep that page up-to-date. Update: The Expert password can now also be calculated with the WeetHet Alcatel Expert password calculator. as with all hacks, and based on official information: applying this hack will definitely VOID WARRANTY! If you are not experienced with tricks like these: stop NOW! Ask someone who is more experienced (even those guys WILL sweat on this one). Read this disclaimer before continuing! This hack has been successfully tested on firmware's GSV7AA3.261 and 235 of the ISDN and PSTN/Analog Alcatel SpeedTouch Home. If you can confirm a succesfull hack with other firmware, then please let me know by mailing me. See the "How to upgrade firmware" page for details. NEW: Available for download now, the firmware Gsv7aa3.281 (ISDN) which I tested with ISDN and it's working. Others have tested the firmware with POTS, and confirmed it to work! POTS/Analog version Gv8baa3.281 (POTS). Warning: Updating firmware is NOT without riscs and can render you modem useless! Tip: With newer firmware (for example GV8BAA3.270 - and 281) releases this hack appears to work aswell. At the "User" prompt you should use the username "guest". After login type "td". You now get the [td]-prompt - Type "prompt"'. You will now get to the expert-mode (sometimes shown as Trace & Debug mode) as seen with the older firmwares, so the MAC address of your adsl-modem will become visible. Note: If you would like to know more about the Alcatel Shell, for example for mapping ports, you will need the command line interface manual, which you can download here. Next problem is that the computer you are using should be able to setup a PPTP dialup connection. This is not only difficult to implement for the no-Windows machines, but also an additional load in general. The hack makes your modem a Pro version. The Alcatel Pro has additional features like acting as a router, DHCP server and it can actually do the dialing work for you. Basically it does everything what WinRoute and the Vigor router do as well. All PC's are automatically connected to the Internet - no additional action required! Not even software like ZoneAlarm is required anymore since both NAT and the buildin Alcatel Firewall manage this for you! Before start this hack, we must make sure that we have everything setup properly. 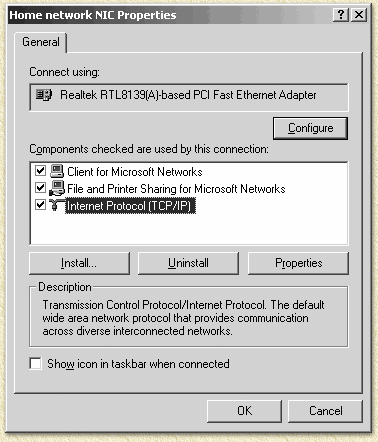 Connect the modem directly to the PC using a standard UTP-cable. Do not use hubs, switches, etc. Make sure the PC is CLEAN! Do not use software like Zone Alarm, WinRoute, etc. Make sure you clean the PC of that kind of software, since (even when not running) it can interfere with the connection from your PC to your modem. Also make sure all dialup-connections are CLOSED. In order to apply the hack, you will need the "Expert" password. Unfortunately I do not know how to "calculate" this password, but at the SDSC website you will find a tool that will do this for you. 3. A prompt appears asking for a username. Enter the name "user" here. 5. Copy the line (without the quotes) saying 'SpeedTouch (00-90-D0-00-00-00)' (the red text in the example above) and open this webpage at SDSC: Calculate expert password script. In the lower part of this webpage (at the "Enter challenge string:" field), you must paste the text you just copied (in this example 'SpeedTouch (00-90-D0-00-00-00)' - without the quotes!). Read the information provided carefully and confirm them by selecting all options and setting them to "YES"on the SDSC webpage. Finally click "SUBMIT". Remember the 10 digit number, here "1552815226" (I wrote it on my modem). Unfortunally the calculator at the SDSC site is no longer available. Alternative 1: The Expert password can now also be calculated with the WeetHet Alcatel Expert password calculator. If all went fine, then you can start applying the hack - read the disclaimer FIRST! This is actually the easiest part, but requires you to be more precise and most of all careful! 7. Enter the 10-digit number you just wrote down and press enter. If you did everything by the book, you should now get a confirmation of the Alcatel modem that you are indeed in expert mode. 10. Now remember this number which was just returned by the drv_read command. Change the last digit to a "6" (without the quotes). This is the actual hack: enter "drv_write 2 1 b XXXX", without the quotes, where XXXX is the number relevant for your modem. Save the original number, as you will need it for undoing the hack. I noticed for ISDN modems that the response is 9600, so the new number will be 9606. Analog modems appear to have a response 8600 (actually, at the www.sateh.com site - which is no longer available -, even 8604 has been reported), the new number for these modems will be 8606. 11. Finally we enter "exit" to exit rip-mode. 12. Enter "system" to enter system-mode, and finally enter "reboot" to have the modem reboot. This is done pretty straight forward. For convenience: shutdown your computer first. On the back of the modem you will find a small hole with the word "defaults" written below it. It's just big enough for a ball-point tip. Insert a ball-point tip into this little hole (actually it's a reset switch) and keep the ball-point tip in there. Switch the modem ON, and hold the ball-point tip in the little hole. You can release the ball-point once the LED's "Line Sync" and "PWR/Alarm" are green (takes about 45 seconds). You have then completed the full-reset. Your modem will now have it's default settings. IP address will be 10.0.0.138 and the subnetmask will be 255.255.255.0. Note: Do NOT activate the ADSL dialin connection you usually would use! This is NOT needed and WILL INTERFERE with the next steps if you do use it. Note: expert mode is still active. Now you can reboot your PC again. The now following setup instructions are for the current (Dutch) KPN MXStream valid only. If you do now use a MXStream account in the Netherlands, then you might need slightly different settings! Bert apparently have tested this hack with the KPN's MXStream ADSL service using XS4ALL as provideraccount, but it also is known to work with Planet. I tested this hack (thanks to FFB who stood next to me sweating like hell ... just like I did) with a HCC-net account. Ludo informed me that this hack works for the Belgian SkyNet as well. 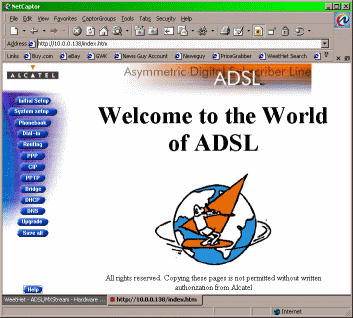 Connect to the modem webinterface by using the Internet Explorer or any other browser. Enter the address "http://10.0.0.138". It is very well possible that you cannot connect. Please consider resetting your PC or using a different PC. Somehow the network settings can be mixed up. Note: Make sure you are no longer connected to the Internet! Tip: Make sure there is NO dialup adapter installed on your PC! Otherwise IE will use it to connect to the modem and block the settings. Click the blue "PPTP" menu button on the left of the now opened window. You will find a list of entries there: remove them all by clicking the blue "Delete" buttons next to them. One entry cannot be remove and remains (it is not an actual entry, it is used to "Add" entries). Click the blue "Apply" button in the left-top corner and click the blue "Save All" button on the lower left. Now click the blue "Phone Book" button and once more remove all entries. Tip by Tristan: If you are unable to delete all entries: goto BRIDGE and remove all entries there. This appears to be an issue with Belgian providers. It can take a while before the modem actually connects and changes to the "Up" "State". If it does not go to "Up", I'd suggest you check the settings (particularly username and password). What might as well is entering the DNS numbers of your ISP - I have a small list HERE. Click the blue "DHCP" button and check the option "DHCP server" and click the blue "Apply" button in the left-top corner and click the blue "Save All" button on the lower left. Now click then blue "DHCP" button once more, and then the "ADVANCED" button (upper right corner), and a new window will open. If you would like to see the actively connected PC, then blue "DNS" button. 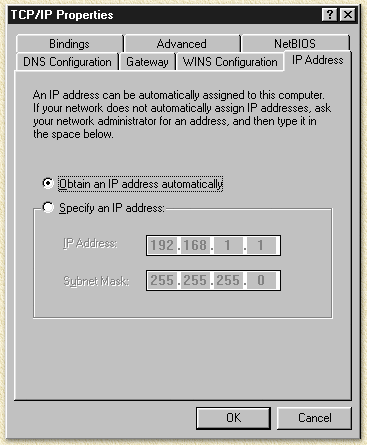 It shows PC name and IP-Address. I'm assuming you're using Windows, click here for Windows 2000/XP or Windows 9x/ME. 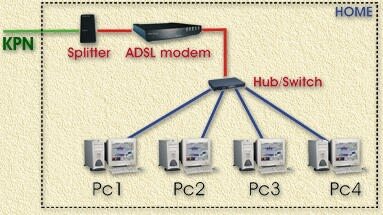 Linux and Macintosh have similar settings: set networking to use DHCP. Configuring the PC's is relative simple. Start the PC (Win9x/ME) and click with the right mouse button "Network Neighborhood" and choose "Properties". 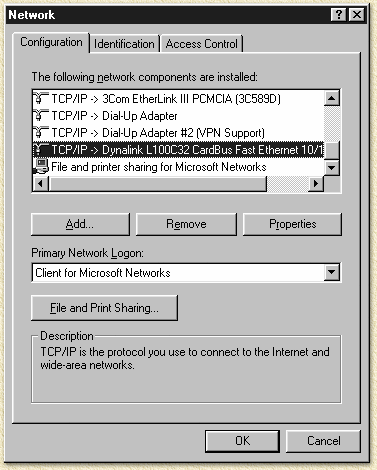 No select the "TCP/IP" protocol that goes with the network-card connected to the router and click"Properties". 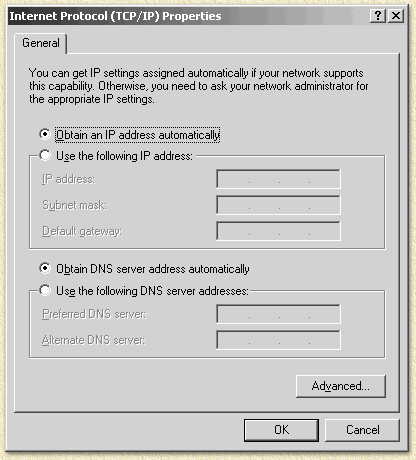 Make sure "Obtain an IP address automatically" is checked. Click "OK" and click "OK" once more. The computer now would like to restart: do so. The configuration is done now. Settings can be checked by typing "winipcfg" in a DOS box or in the "Start"- "Run" box. Click "OK" and click "OK" once more. The client is now configured. Windows 2000 does not require a reboot, it takes a few seconds before Windows gets a new IP-address (Use IPCONFIG in a DOS-box to verify).